So it’s summertime again, and not a moment too soon. Spring and autumn, those transitional seasons that start on the last day you’re likely to see frost on the lawn and end the moment you can go to bed knowing there’ll be no need for a coat in the morning – or the other way round – can really drag on. The British year is composed of an immense slog of inclemency that stretches from September until May, or June, or whenever the sun finally decides to get its act together, and a meagre ration of fragile warmth. It’s like a far-too-brief summer holiday, where you spend longer in the departure lounge or the arrival hall than you ever do poolside. The upshot is that, when the sun finally flexes its muscles, you’d better be ready to enjoy it, with a wardrobe full of flip-flops (well, at least two), a bathroom cabinet full of sun cream and a fridge full of stuff that’s cold, dry and zings. When it comes to wine I’m a fickle fellow (fella, I guess), as I suppose most of us are, to a greater or lesser extent. There can no space in wine for monogamy. Only wild, unbounded promiscuity is appropriate. It’s best to drink around. But I do think it’s OK to have a small vinous harem in whose more familiar embrace you can always find pleasure. And at this time of year it seems I keep coming back to one wine in particular, and that wine is Hatzidakis’ Santorini assyrtiko. A few months ago I had the pleasure of meeting Haridimos Hatzidakis, the man behind my summer fling, at a tasting organised by Theatre of Wine, whose wildly eclectic selections make them the pimp of choice for north London’s polygamous winelovers. As at the table next door some chap from France wowed a crowd with his fabulous repertoire of excellent anecotes, Harry – as he’s known for short – stood with his arms crossed, scowling. He’s clearly not a man entirely without warmth – I witnessed him share a congenial embrace with Sebastian Payne, winebuyer from The Wine Society, who stock the Santorini assyrtiko* (as do Waitrose) – but to those without a long history of buying his wine in massive quantities he was not precisely talkative. Google images has conclusive evidence that he’s capable of smiling, but here’s my picture of him, in a room full of opinion-makers and potential purchasers, looking at a wall. At this point it would be hopelessly cliched to suggest that he lets his wines do the talking, but the fact is that they are remarkably talkative. 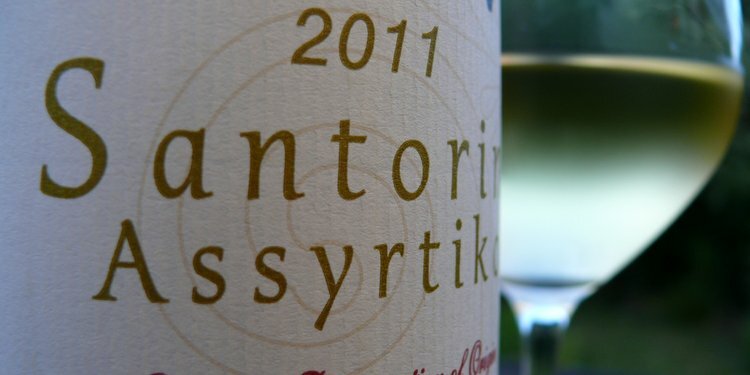 There’s the taut, mineral, citrus-packed Santorini assyrtiko, absolutely splendid but also straightforward enough to be stocked by a major supermarket, but also the unfiltered, single-vineyard Mylos, which has the grassy lemoniness familiar from the cheaper version but with added sensory thrills – it’s fabulously silky in the mouth – and just brilliant, certainly the finest Greek wine I’ve ever tried (recently spotted at Theatre of Wine and The Wine Society, but wine-searcher currently shows just four stockists in the entire world), and the flamboyantly characterful, spicy, golden-verging-on-orange, ludicrously small-production ancient-vine Pyrgos. All are 100% assyrtiko, all absolutely work seeking out. 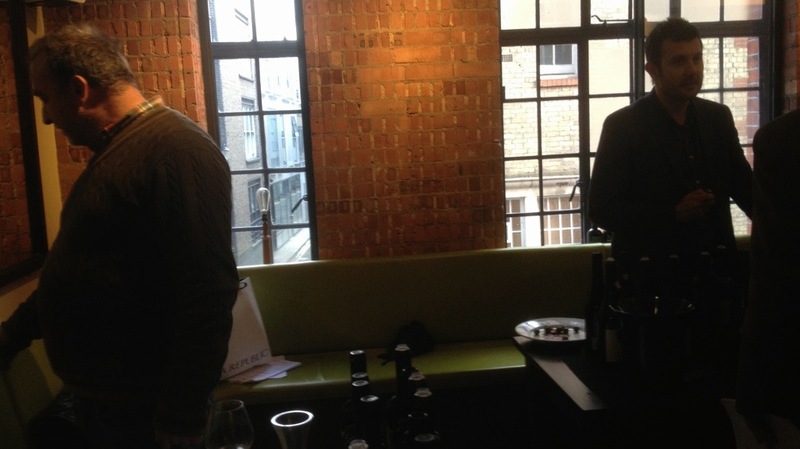 As for Haridimos, perhaps I caught him on a bad day – after all, I’m sure these tastings must become execrably dull for winemakers after a while. Maybe he was just hungover – and given how irresistible I find some of his wines, and how many of them he’s probably got in his basement, I could hardly blame him for that. But I must admit to finding it entertaining that the wine I turn to when the weather’s at its finest is crafted by a man whose disposition seems anything but sunny. * In a move that flies in the face of all known laws of economics and logic, The Wine Society have just moved from the 2011 vintage to the 2012 and reduced the price by a pound, from £10.95 to £9.95, in the process, having apparently significantly misunderstood the direction in which wine prices traditionally move. At Waitrose it’s £10.99, but occasionally reduced by 20% if you’re eagle-eyed. Lidl are selling the stuff also at 8 quid, or were last week. Not bad. That is cheap. Sadly there’s no Lidl in my corner of north London, so their bargains tend to pass me by, but that certainly is one (though when on 20% off at Waitrose it’s not that much more, at £8.75 or so). We recently returned from Santorini, having thoroughly enjoyed the wine, and learning about the unique manner in which it’s cultivated. We’re hoping to find one of our favorites from Sigalas Winery elsewhere in Europe. It was a beautiful summer wine! I’ve never been to Santorini, but it’s certainly appealing – it’s got the perfect climactic double-whammy of being mild in the winter, rarely dipping below 10C, and not aggressively hot in summer. In other words, I think I could live in Santorini, though perhaps I should visit before I do anything drastic.